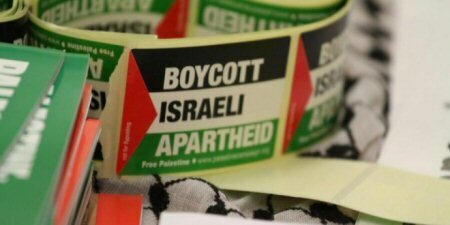 In what is being cheered as a victory for the Boycott, Divestment and Sanctions Movement, the international banking firm HSBC has announced that it is divesting from Elbit Systems, the second-largest weapons manufacturer in Israel. Europe’s largest bank confirmed, on Thursday, that it has completely liquidated its holdings in the Israeli firm “Elbit Systems”, due to public pressure orchestrated by the boycott, divestment and sanctions movement, according to a statement by Britain’s Palestinian Solidarity Campaign. In a statement from Ryvka Barnard of the group War on Want, the group praised the decision, saying, “HSBC has taken a positive first step in divesting from Elbit Systems, the notorious manufacturer of drones, chemical weapons, cluster bomb artillery systems and other technology used in attacks against Palestinian civilians, and to militarize walls and borders around the world”. Her statement continued, “Doing business with companies like Elbit means profiting from violence and human rights violation, which is both immoral and a contravention of international law”. Elbit is the biggest private arms company in Israel, and is second only to the Israeli military itself. According to the group WhoProfits.org, which tracks the activities of companies connected with the Israeli military, Elbit’s biggest single customer is the Israeli Ministry of Defence. In 2017, sales to the IMOD generated 19% of Elbit Systems 3,377.8 million USD revenue. According to the Electronic Intifada, Elbit Systems has already been excluded from pension and investment funds around the world over its involvement in supplying surveillance systems and other technology to Israel’s separation wall and settlements in the occupied West Bank. According to WhoProfits.org, Elbit supplies 85% of UAVs used by the Israeli army. One of Elbit’s most famous UAVs the Skylark – an intelligence gathering drone, operational in the Israeli army since 2008 – which is used during military operations of house arrest in the occupied West Bank. The Skylark was used during the so-called “Brothers come home” Israeli attacks in June and July 2014, where scores of Palestinian civilians were arbitrarily arrested. During Israel’s deadly attack on Gaza in 2014, Elbit’s 7.5 Skylark, as well as its lethal UAV, the Hermes 900, were used. The Hermes 900, which was assembled jointly with L-3 Communication in a 120 million USD venture, can stay aloft for up to 24 hours at altitudes of up 18,000 feet and has an array of optical, infrared, and laser sensors that allow the operator to identify and track targets as well as to guide munitions in flight. The UAV carries two Spike-MR missiles, produced by the Israeli firm Rafael Advanced Defense Systems Ltd.
Israeli media routinely reports of the crashing of Elbit’s Skylark UAV during intelligence gathering operations in Gaza. The anxiety-inducing buzzing of Israeli military UAVs has become a permanent soundtrack to the lives of Palestinians in Gaza. The company has been one of the main providers of the electronic detection fence system to the Apartheid Wall in the occupied West Bank. Elbit, in cooperation with the Israeli military, developed a tunnel detection system installed as part of the matrix of technologies used to keep around 2 million Palestinians besieged in the Gaza Strip. This technology is a state secret; Elbit is urging the Israeli government to grant permission for its export. While HSBC did not make a public statement about the divestment, a representative from the company told a reporter from Al Jazeera that the company does not take stands on political conflicts, but they adhere to international standards of human rights. The Palestinian Solidarity Campaign said that HSBC agreed to divest from Elbit following a year-long campaign that included regular demonstrations in front of the bank’s 40 branches in Britain and emails from 24,000 people. It argued that HSBC’s investments in Elbit, “which sells weapons to the Israeli military used in attacks on Palestinians,” violated the bank’s own policies about ties with defense contractors, even if, as HSBC claimed, they were made on behalf of its clients.